Get ready for a female-led summer of rock – this year, Heart join forces with Joan Jett and the Blackhearts to bring fans the Love Alice 2019 tour. 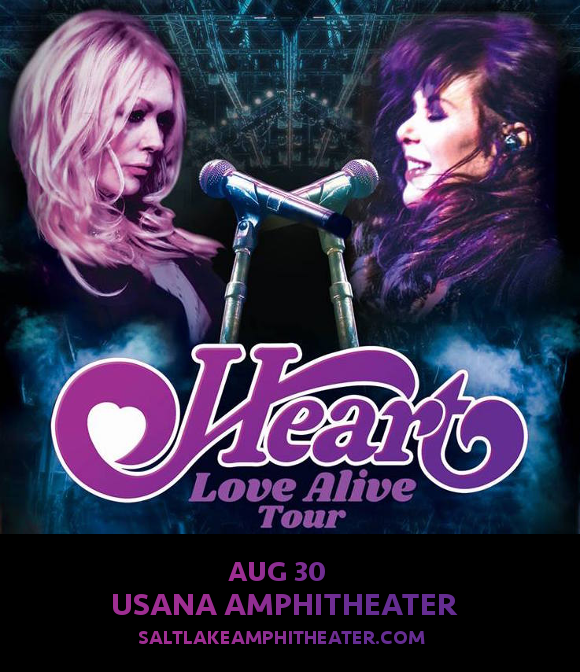 With Elle King as support, they’re coming to the USANA Amphitheater on Friday 30th August 2019 for a show that you’ll never forget!! Don’t miss out – grab your tickets today and get ready for a nostalgia trip with Heart and Joan Jett and the Blackhearts!! Currently comprised of siblings Ann Wilson and Nancy Wilson in addition to Ben Smith, Craig Bartock, Chris Joyner, and Dan Rothchild, Heart were one of the biggest classic rock acts of the 70s, and one of the earliest adopters of elements of heavy metal and hard rock into an otherwise folk-based sound.Their albums have hit the top 10 of the Billboard 200 in four separate decades, and to date, they have sold over 35 million records around the world, including 22.5 million just in the United States. We can hardly wait – can you?? No?? Then don’t miss out on your chance to grab tickets – get ‘em NOW before they go! !